The nationwide Tribunal in Cologne brought to the forefront the perspectives of those affected by the crimes of the right-wing terrorist group NSU, the voices of the survivors of the waves of violence in the 1990s, as well as other previously unheard voices. The continuation of racism and institutional racism could no longer be denied. But after the Tribunal is before the Tribunal: we also want to use the experience of the Tribunal to continue working on its perspectives and develop it further. In 1992, shortly before the violence in Rostock-Lichtenhagen there were also massive attacks in western Germany, such as those in Mannheim, Schönau. The tenth murder in Heilbronn was attributed to the NSU Complex. The antiziganistic investigations show a continuity which the NSU Inquiry Committee in Baden Württemberg failed to consider. We invite everyone who wants to participate in the indictment against racism to share their story with us and to draft a counter-narrative. 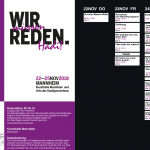 On Thursday, 22 November we will watch films at different places in Mannheim, as part of day-to-day life, before the main program starts the next day on 23 November. On 23 November we will open the Tribunal in memory of Yeliz Arslan, Ayşe Yılmaz and Bahide Arslan, who were murdered in Mölln in 1992. On this day we will concentrate on the reality of the lives of the guest workers and their struggles in Mannheim and everywhere. There was an attempted pogrom in Mannheim, Schönau in 1992 as well as right-wing violence in the west, which stopped just before the attacks in Rostock-Lichtenhagen. These and other pogroms represent an attack on migrant life as well as Jewish and Romno life. Survivors and contemporary witnesses will take the floor. We will denounce the Nazi structures and power structures in this society, unmask institutional racism and name those responsible. We will extend the indictment of the Tribunal with stories from Baden-Württemberg and elsewhere. We will present the reality of a society that does not want to hear these stories or makes them inaudible. But the stories continue to be written and do not stop. Today, the debates about numbers, usefulness and percentages of refugees are, once again, leading to violence. The people who experience these brutal realities will name them clearly and make their struggles visible. On 24 November, Ibrahim Arslan and Can Candan will inaugurate the main programme: From the Fall of the Wall to the Nail Bomb. After that, the affected people will speak and report on the racist investigations in the NSU murder series. In Heilbronn, too, people suffered for years from antiziganist investigations. And what does the 10,000 list of attacks with spied targets mean? Are there other victims? And who are the supporters? What does the end of the NSU trial in Munich mean and how did the press conduct itself until then? The NSU complex is not an isolated case. That, too, will become clear and unmistakable on this day. Together we will talk about the urgent struggles, the demands, and strategies to deal with these issues and perspectives. Because together we will charge, we will indict and, we will sue – a society to change these conditions. The main programme will be complemented by workshops, installations, guided tours and exhibitions. 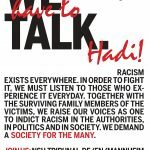 On 25 November we will meet again and invite all those who wish to join the indictment against racism to share their story with us, to draft a counter-narrative, and to network with each other even more. Duvarlar-Mauern-Walls, is a trilingual (Turkish, German, English) documentary about a period in the recent history of the largest minority in reunified, post-Wall Berlin: the Turkish immigrant community. They reflect on the opening of the Wall and the subsequent reunification and also how increasing hostilities are affecting their sense of belonging in the new Germany. Between Baroque, Industry and Culture. A personal walk to take a look at Mannheim´s attractions. Rarely has an identity-political, racism-critical approach like Critical Whiteness triggered so much controversy. Even the anti-racist scene itself seems split in this respect. One thing is certain: at a time when ultra-nationalist, racist, political movements are becoming socially acceptable, those who stand for the strengthening of a diverse society must unite. give inputs on refugee self-organisation, state violence in Southern German camps and the legal process against the Donauwörth refugees. The focus is on how to build practical solidarity with the victimized people and a wider networking around the issue. We have to build structures, hadi! SchwaPo, a working group of the Initiative Schwarze Menschen in Deutschland (Initiative of Black People in Germany), would like to invite all interested post-migrant activists, BpoCs, Afros, Känäx and Nafris to a networking meeting. Together with you we will talk about our experiences, disappointments and hopes for the development of a broad, anti-racist structure. Short inputs about: Identity, Movement and Racism. The artist Ülkü Süngün performs Takdir/die Anerkennung/the Appreciation by teaching interested people the correct pronunciation of the names of the ten murder victims of the NSU. This participative performance is conducted 1:1 with the participants. Through the participants chorus this style of speaking evokes a form of memory and recognition that creates a temporary commemorative community. The exhibition thematically covers the history of the Sinti and Roma since the first written mention in 475 BC and their post-war history. 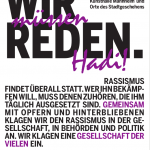 It shows the beginnings of the civil rights movement to the present day, the first state treaty in Baden-Württemberg in 2013 and the opening of the 'Antiziganism Research Centre' at the University of Heidelberg. From 26 May to 13 June 1992 pogrom-like attacks took place in Mannheim-Schönau at a shelter for refugees. People showed solidarity in front of the shelter and thus prevented further attacks. Mitteperformance is a temporary artists´ collective that critically examines the NSU complex and its social negotiations. The exhibition within the framework of the NSU Tribunal shows works that refer to the NSU investigation committee in Baden-Württemberg. Meeting point: Georg-Lechleiter-Platz in the Schwetzinger Vorstadt We want to commemorate the victims of the terror regime during the National Socialist era(1939-1945) in Mannheim. We are talking about, among other things, terror verdicts, the hereditary health courts, and about the people who opposed the terror system. Original language: English, subtitles german. Film contains violent scenes. Film by Jackson Landers and Brian Wimer. 2017, USA 91 min. Panel discussion with Jackson Landers, Danilo Starosta from Kulturbüro Sachsen, and Esther Dischereit. On 12 August 2017, white racists marched into the city of Charlottesville, USA. The Alt-Right had joined forces, Ku-Klux-Klan supporters showed up with open visors and burning torches. At the end of that day, two police officers and the counter-demonstrator Heather Heyer were dead. Film by Mala Reinhardt, 62 min, 2018. Panel discussion with Mala Reinhardt, Patrick Lohse, Özge Pınar Sarp, Ibrahim Arslan, and Ayşe Güleç. In view of continuing racist riots, the inadequate clarification of the NSU complex and the entry of the AfD into the political landscape of the FRG, May Phương, Ibrahim and Osman have made a decision: they will no longer remain silent. Their stories weave into each other in the process. And while they advocate a complete clarification and an end to violence, a network of people who have experienced something similar begins to emerge. 13.25-15.25 pm We Have to Talk, Hadi! RomnoKher B7, No. 16 – *WE TALK I and II will take place simultaneously. Please see the notice board. WE TALK I*: We can build together, one step at a time! In many cities, a large network of black people and People of Color (BPoC) activists has been formed over the past few years, bringing together intersectional, solidarity-based perspectives. We would like to build on this in Mannheim and the Rhine-Neckar region. We are here to establish structures. Our topics are: racial profiling, Copwatch, art and culture productions, and political education work. In the lament about the victims of racist violence, the mechanisms of racism and the necessity of strengthening migrant knowledge are formulated. In the indictment, responsibilities are named and structures are offensively fought against. The suit demands recognition of the (post-) migrant realities. The round table tries to question this strategy with regard to its potential for a left-wing transformation policy. Programme and locations	The events will be translated simultaneously and will be available in German, Turkish and English. Enough talk about us: Now we want to talk! We have to talk hadi! We are working here…. And living here! We will get back our rights! – The events in the main programme will be interpreted simultaneously and can be heard in German, Turkish and English. – Entry through the backyard. – Some of the rooms are wheelchair accessible. – Please note that only certain areas may be filmed or photographed. – The organisers reserve the right to make use of their domestic authority and to deny access to or exclude from the event persons who belong to extreme right-wing parties or organisations, to the extreme right-wing scene or were conspicuous in the past through racist, nationalist or other inhuman statements. Wir klagen um Enver Şimşek, Abdurrahim Özüdoğru, Süleyman Taşköprü, Habil Kılıç, Mehmet Turgut, İsmail Yaşar, Theodoros Boulgarides, Mehmet Kubaşık, Halit Yozgat und Michèle Kiesewetter.